A pirate without jewelry? Who ever heard of such a ridiculous thing? We certainly have not, which is why we offer a number of items that are perfect accoutrements that are great to hang around a pirates neck. 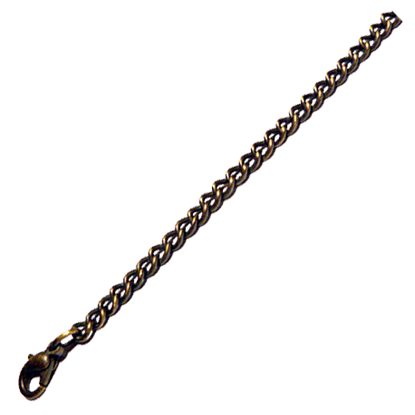 Now, truth be told, a great deal of jewelry is somewhat appropriate for a pirate to wear, especially in the realm of necklaces; really, as long as its valuable, it is something a pirate might have considered wearing. But if you are looking for something that looks valuable and features pirate symbols and pirate feeling, then you are going to need some of our pirate and nautical necklaces. More often than not, your typical pirate necklace looks very similar to a coin of some kind, which makes a bit of sense. Most pirates could not smith their own jewelry, so instead, they would convert something they like into jewelry to wear. And pirates like coins but only coins that are valuable. So many of our pirate necklaces happen to look like coins too; some of them look like cursed gold coins and some look like ancient silver coins. 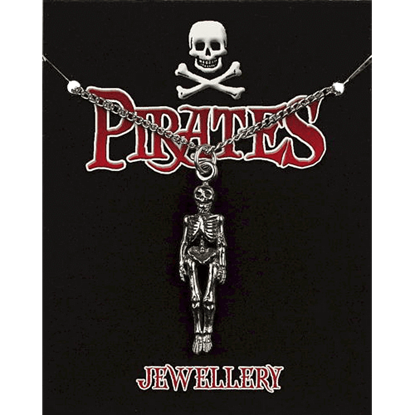 But all of our pirate necklaces are fantastic accessories to dangle around a pirates neck, whether he is the lowliest swashbuckler or the grandest pirate captain. 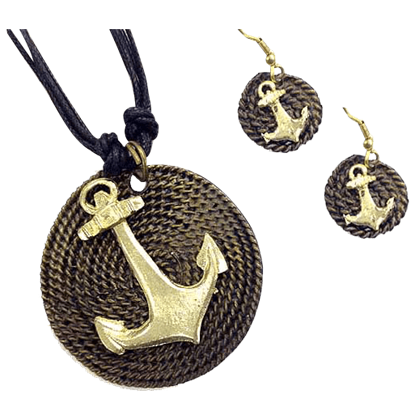 Make a splash on the fashion world with a daring and vibrant collection like the Brass Anchor Jewelry Set. You will be showered with compliments after you proudly model these original accents to your next social function. 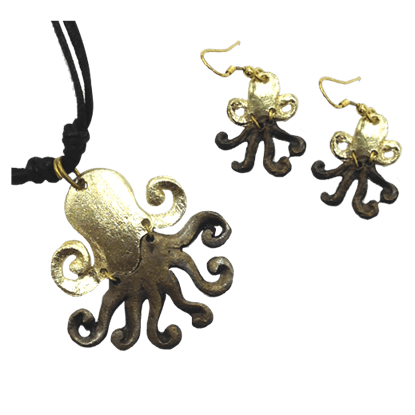 Now you can bring home the ocean without getting your feet wet with the adventurous Brass Octopus Jewelry Set. This daring accessory will have your friends and family all impressed by your love of the sea and its creatures. 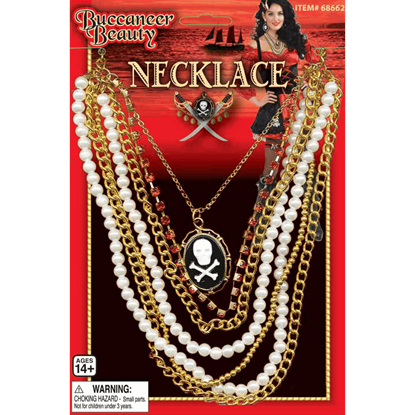 This necklace is a rich array of decorations, so much so that this Buccaneer Beauty Layered Cameo Necklace makes it look as though a female pirate is wearing all the riches she is accumulated on her pirate voyages. If pirates are known for their love of extravagant shiny things, than pirate captains are the most notorious of the lot. 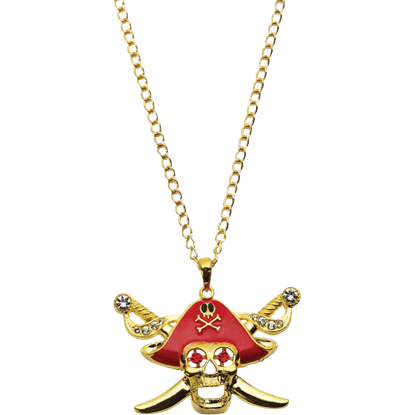 Luckily, this Buccaneers Captain Necklace has all the shine that a pirate captain could want in an accessory. 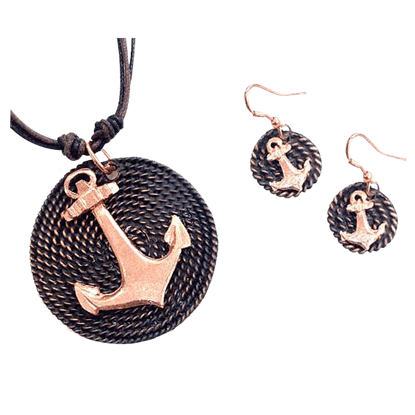 This Copper Anchor Jewelry Set is idea for anyone who loves the thrill of adventure and the styles of sailing. Now you can add a new dimension to your wardrobe with a little help from this nautical themed collection. 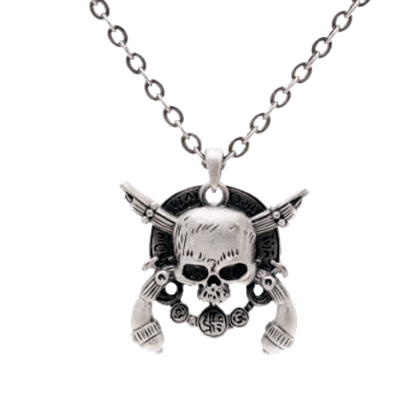 The Crossed Skull Necklace is an intriguing item that features a distinct pirate style. This necklace features a worn skull with a pair of pistols crossed behind it, slightly altering the look of the traditional skull and crossbones. From nautical folklore, the modern representation of the Davy Jones Necklace is here to accent your look. This captain of the Flying Dutchman is as intimidating as it is fashionable and would be recognized by anyone sailor. Three is regarded as a powerful number, symbolically occurring throughout history. 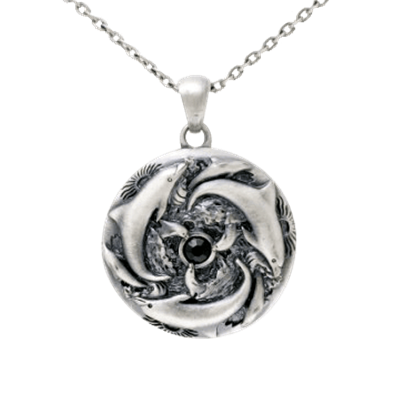 The Dolphin Trinity Necklace features a circular shape and depicts three trios of dolphins, the foremost circling around a central accent stone. 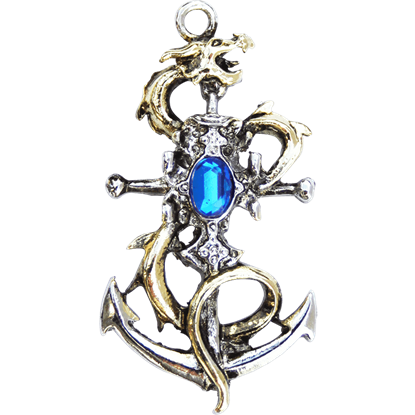 Fact meets fiction in this Drakes Leviathan Pendant! Named after two monsters of the sea this pendant features an intriguing connotation that many, back in the age of sailing, would likely support, assuming they knew Drakes reputation. 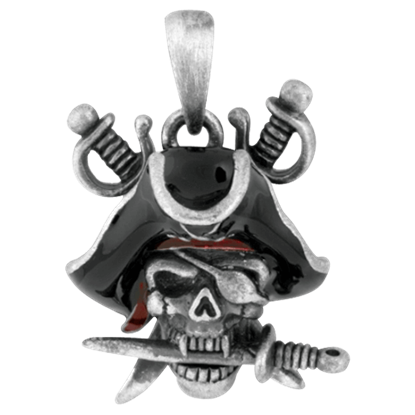 The Pewter Pirate Skeleton Necklace depicts the grim herald of the buccaneers who terrorized the oceans during the Golden Age of Piracy. Whether merchant or naval officer, few would spy this emblem without acquiring a sense of dread.